Position detection is available ezABSO® singly due to the converter system is incorporated inside. The life span of general light emitting and light receiving elements is forty thousand hours. Being exposed to hotter temperature accelerates deterioration process even further. Some PLGs are used an electrolytic capacitor. The adjusted value might fluctuate. There is a glass slit disk which is vulnerable to vibrations and shocks, and it leads to cracks easily. The output pulse number depends on glass slit, and cannot be changed. Four options[A],[B],[C] and [D]are available. 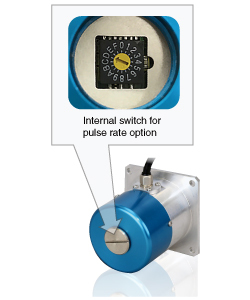 Switching the setting (0-F) of inner switch can change the pulse number. This product is a push-pull output circuit. A custom-made product "EZA-SADR[　]-04" is available when you need to use line driver output. In addition, shaft diameters "Φ6 and Φ8" are also available. Contact your NSD representative for further details. ezSCOPE is a sensor visualization tool. 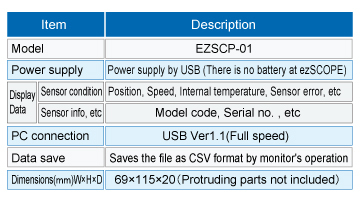 By connecting the two lines of the sensor output line to the ezSCOPE main unit, it is possible to capture the sensor internal data via the USB to the PC. The captured data can be displayed on the PC monitor in real time with numerical values and waveforms. It also has a data backup function. The wiring from the sensor to ezSCOPE can be extended. Since the sensor connection input part of ezSCOPE is insulated, it doesn't affect the sensor operation. 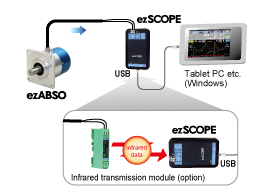 The infrared transmission module (option) can be used to transmit data to ezSCOPE main unit.